The title of the infographic is "Canada's merchandise trade with the CPTPP member countries, 2017"
This infographic contains a map of North America, the western countries in South America, Australia, New Zealand, and the eastern countries of Asia, with borders drawn between all countries. 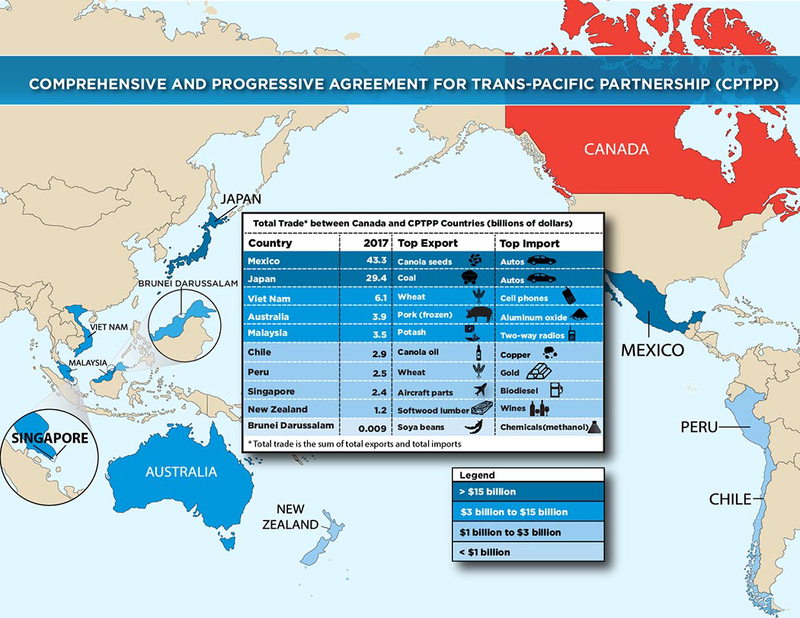 The map indicates Canada's total merchandise trade (imports plus exports) on a customs basis for every member country of the Comprehensive and Progressive Agreement for Trans-Pacific Partnership (CPTPP) in 2017. The member countries are depicted in shades of blue. On this map a darker colour indicates a higher amount of total trade. Countries that are not members of the CPTPP are not labelled and are depicted in beige. Canada is depicted in red. Category 1 (dark blue) represents countries where total merchandise trade is greater than $15 billion. The countries included in category 1 are Japan and Mexico. Category 2 (medium blue) represents countries where total merchandise trade is $3 billion to $15 billion. The countries included in category 2 are Australia, Malaysia, and Viet Nam. Category 3 (light blue) represents countries where total merchandise trade is $1 billion to $3 billion. The countries included in category 3 are Chile, New Zealand, Peru, and Singapore. Category 4 (very light blue) represents countries where total merchandise trade is less than $1 billion. The country included in category 4 is Brunei Darussalam. Source: Statistics Canada, Canadian International Merchandise Trade Database, 2018.